A chance for me to share my thoughts (or, maybe just vent a bit). I’d hoped that when John McCain conceded the 2008 election, his running mate would fade back into the wilds of Alaska and spend her time looking out upon Russia and pardoning turkeys. And then I hoped that when she quit as Alaska’s Governor, she would fade off into the lecture circuit and people would grow tired of her. Unfortunately, while she has gone on tour, she’s hasn’t faded away. Instead, she’s continued to bring her populist form of stupid to the right wing and they seem ever more willing descend to her level. Her following has begun to exhibit a cult-like fascination with her where she can or say no wrong. The past few days have provided ample examples of Palin’s “appeal”. Every year, the liberal Dems and the RINO Republicans turned up the temperature ever so slightly. It seemed after awhile that we'd all be boiled to death in a cauldron of the nanny state. And then something really odd happened -- mostly because we do not have a civics literacy test before people can vote in this country. People who cannot even spell the word "vote," or say it in English put a committed socialist ideologue in the White House. Name is Barack Hussein Obama. These comments were punctuated with applause from the teabaggers. I guess these folks either don’t remember Jim Crow laws (um, what about that civics literacy test) or they want to return to the days of Jim Crow laws. Sarah Palin could have shown real leadership by taking on these sorts of comments directly and trying to drive the right wing away from what Sen. McCain’s daughter Meghan referred to (on ABC’s The View) as “innate racism”. What did Sarah Palin do? Besides repeating the very broad themes that lost the 2008 election, she criticized President Obama for being a good orator that uses a teleprompter (and it’s worth noting that when giving her speech to the 2008 Republican convention — the speech that brought her to prominence and made her into a conservative hero — Palin used a teleprompter, too). Now I think that particular criticism of President Obama is simply silly. Most speeches these days are given from a teleprompter so that the speaker can look out at the crowd and not down at notes. It may be fair to compare use of a teleprompter to a politician’s ability to speak extemporaneously, but the use of a teleprompter isn’t any different than resorting to written notes. Nevertheless, for some reason, this criticism from Palin has gotten some positive attention (at least on the right), so I want to note two additional things: First, during her speech to the Tea Party convention, Palin read her speech from paper on a lectern (she also criticized President Obama for lecturing from a lectern); second, when President Obama met with House Republicans and spent over an hour responding to their questions (and taking them to task if not eviscerating them), he didn’t use a teleprompter. But he was very, very conversant on the issues. (For that matter, it’s worth comparing President Obama’s interview with Katie Couric before the Super Bowl to those infamous interviews that Couric did with Palin.) But to the Cult of Palin, President Obama is “bad” because of his use of a teleprompter and Palin is the “common American” standing up against President Obama’s socialist/elitist ability to string a bunch of words together coherently. 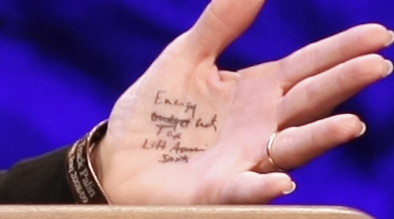 So what exactly was written on Palin’s hand? Wow! Those are some pretty tough things to remember, aren’t they. I think she did it on purpose. I think she did it on purpose, yeah. Because it’s an exact opposite of reading off the teleprompter with a script written for you with every word in a sentence and here’s she’s just taking crib notes on her hand. It makes her look like she can just talk off the cuff and that she just she jotted down a few couple notes before she went out to give a big long speech. I think that is — like you said before Gretchen — folksy, absolutely, down-to-earth, I can identify. Leave it to Faux News to be quick to jump to Palin’s defense; she’s not dumber than a box of Alaskan rocks; she’s folksy and did it on purpose to make that big bad Obama guy look too smart! And we know that smart is just a synonym for “socialist”! But the idiocy doesn’t end here. Nope. Say [Obama] played, and I got this from [Pat] Buchanan, reading one of his columns the other day. Say he played the war card. Say he decided to declare war on Iran, or decided to really come out and do whatever he could to support Israel, which I would like him to do. Now remember that Palin famously told Katie Couric, in response to the question of what newspapers she reads, “all of them”. Well, it appears that she only reads headlines. You see Pat Buchanan’s column doesn’t seem to suggest playing the “war card” at all. Had Palin read to the end of the article (hey, can we blame her; I mean it is 800 words long and they won’t all fit on her palm) she would have seen that Buchanan was actually rebutting a proposition set forth by neocon Daniel Pipes in an article in the National Review (and Pipes is now touting the fact that Palin endorsed his strategy). The point of all this seems to be twofold: First, Sarah Palin can’t see Iran from Alaska, so she has no knowledge or expertise on the issues; second, she can’t quite manage to take the basic concepts away from articles on the subject without getting things, at least somewhat, backward. And besides all that, do we really want someone who may aspire to be President to take her foreign policy advice from Pat Buchanan (or Daniel Pipes, for that matter)? But we’re still not quite done with the “week in stupid”. Nope. It seems that last year, White House Chief of Staff Rahm Emanuel scolded a group of liberal activists for alienating lawmakers from whom they needed help. On February 1, 2010, Palin weighed in via Facebook. I would ask the president to show decency in this process by eliminating one member of that inner circle, Mr. Rahm Emanuel, and not allow Rahm’s continued indecent tactics to cloud efforts. Yes, Rahm is known for his caustic, crude references about those with whom he disagrees, but his recent tirade against participants in a strategy session was such a strong slap in many American faces that our president is doing himself a disservice by seeming to condone Rahm’s recent sick and offensive tactic. The Obama Administration’s Chief of Staff scolded participants, calling them, “F---ing retarded,” according to several participants, as reported in the Wall Street Journal. Just as we’d be appalled if any public figure of Rahm’s stature ever used the “N-word” or other such inappropriate language, Rahm’s slur on all God’s children with cognitive and developmental disabilities – and the people who love them – is unacceptable, and it’s heartbreaking. A patriot in North Andover, Massachusetts, notified me of Rahm’s “retarded” slam. I join this gentleman, who is the father of a beautiful child born with Down Syndrome, in asking why the Special Olympics, National Down Syndrome Society and other groups condemning Rahm’s degrading scolding have been completely ignored by the White House. No comment from his boss, the president? Mr. President, you can do better, and our country deserves better. Our political correct society is acting like some giant insult’s taken place by calling a bunch of people who are retards, retards. I mean these people, these liberal activists are kooks. They are looney tunes. And I’m not going to apologize for it, I’m just quoting Emanuel. It’s in the news. I think their big news is he’s out there calling Obama’s number one supporters f’ing retards. So now there’s going to be a meeting. There’s going to be a retard summit at the White House. Much like the beer summit between Obama and Gates and that cop in Cambridge. Governor Palin believes crude and demeaning name calling at the expense of others is disrespectful. I didn’t hear Rush Limbaugh calling a group of people whom he did not agree with ‘f-ing retards’ and we did know that Rahm Emanuel has been reported, did say that. there is a big difference there. Now go back and read Limbaugh’s statement again: “[B]y calling a bunch of people who are retards, retards”. The only difference is that Limbaugh didn’t punctuate his statement with profanity. So not only is Palin stupid, she’s also an unrepentant hypocrite. At the end of the day, we really have to wonder about people who believe not only that Palin is qualified to do much of anything, but that she is qualified to be a prime spokesperson for an ideology, let alone, to be President of the United States (and remember the survey that I wrote about a few days ago: only 14% of self-identified Republicans believe that Barack Obama is more qualified to be President than Sarah Palin). Palin may have some kind of mass appeal and “street smarts” but, in fact, she and those who slavishly fawn upon her and follow her every word (almost like a cult), are stoopid. The time has come for Caribou Barbie to go back to Wasilla, look after her kids, and leave politics and governance for those who can remember their core principles without cheating. OK, are you kidding me? You are going to try and discredit Fox News and give credibility to Keith Olberman all in the same argument? This is a joke right? If you truly want to sound credible and objective yourself you cannot possibly use Olberman as a viable reference. He is no more legitimate or fair as those you try to rip in this post. He represents all that is hateful, arrogant, and elitist that is the Liberal Left. If you want to make Palin and others like her invalid, stop paying attention to her. In spite of what you fear, the vast majority or us don't care what she says. I hate to say it, but Palin was quite the socialist as governor of Alaska... And despite what you want to continue to argue, President Obama is not a socialist. Who Is Ready to Help Haiti? © 2008-2017 Michael S. Wallack. All rights reserved. Although I shouldn't have to say it, any opinion expressed herein is solely that of the author and is not necessarily representative of any association or organization with which I may be affiliated or involved or any company by whom I am employed. My employers expressly disclaim any responsibility for or involvement in my posts and I think them giving me the freedom to offer my thoughts and express my feelings via this blog.